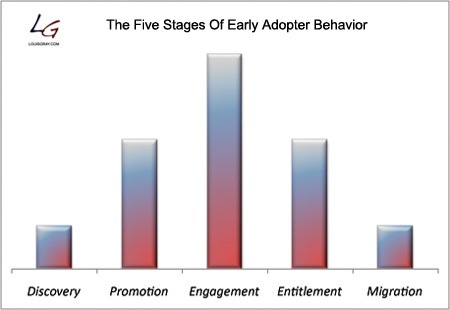 A few weeks ago, Louis Gray posted a good article on the five stages of early adopter behavior, find the graph about the five steps below. Although not literally mentioned the graph shows an important ‘early adopter’ characteristic that we underestimate all to often: the need for change. The last few years, with the rise of web2.0 etc it seems like all you need to become successful is connect with early adopters and allow them to spread the word, eventually resulting in everybody using your product/service. Now you won’t hear me say this approach is not important but there’s a rather big disconnect between early adopters and the mass out there and that’s related to this need for change. I consider myself an early adopter, I want change. It’s like when you’ve signed up to something new and after you get used to it, you’re slowly looking out for something else, that excitement to try something new again… hoping it will surprise you with some nifty innovations. That said, most of the people around me aren’t like that at all. They aren’t early adopters in the technology space, and more important they don’t like their tech to change at all. And there’s nothing we can do to change that, just don’t forget that when you want your service to spread beyond the early adopter sphere you will need more than just buzz. You’ll need a reason for change, and a pretty darn good one. People need to feel safe before they are going to change. Therefore it’s is so important that your peers can guide you when you step into new technology.